Purchase Spectralux tubes with our electronic starters and receive a 5 year tube replacement guarantee. If any tubes fail from normal use within 5 years from date of purchase we’ll send you a replacement tube FREE of charge. Starters are only $5.50ea with a tube purchase. Using Radium Spectralux Hi – Grade daylight tubes are an investment in quality and performance. These fluorescent tubes are made in Germany will provide years of high quality light. Benefits as reported by our customers are: reduced glare around desk and work areas, reduced eye strain, less headaches. Good quality lighting is essential for productivity and worker comfort. Also Spectralux Hi – Grade tubes are ideal for improved colour rendering and merchandising – showing products in their true colors. See what our customers say about Spectralux tubes. Fantastic Lighting is a preferred supplier of the Spectralux Hi Grade daylight range in Australia. Manufacturer, Radium NL, founded near Cologne, Germany in 1904 is one of Europe’s largest and most respected lighting manufacturers. They are certified for ISO 9001 (quality standard) and ISO 14001 (environmental standard). Spectralux lamps have proven their longevity with customers still benefiting from lamps purchased back in 2000 when Fantastic Lighting was founded. Read more about Spectralux Hi – Grade tubes. Use Spectralux tubes with our electronic starters to dramatically increase tube life. Save 50% on electronic starters with tube purchase. Read about electronic starter benefits. Need your new fluorescent tubes professionally fitted into your workplace? We offer a FREE fitting service for our tubes and starters within our Australian distributor / franchise network. Contact Us to arrange or enquire. PRICES SHOWN ARE THE COST PER TUBE (DEPENDING ON QUANTITY PURCHASED) INCLUDING FREE SHIPPING TO YOUR DOOR. Lumen depreciation simply means the amount of light loss a tube suffers over time. Spectralux tubes retain their brightness long after most other tubes have gone dull. 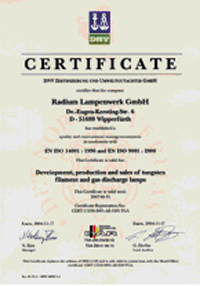 Certificate – ISO 14001, ISO 9001 environment and quality certification of our manufacturing partner, Radium Lampenwerk, Germany.